← What is Best in Life, Conan? I’m writing this on a MacBook Pro that I’ve had for more than two years — longer than any Windows laptop I’ve owned (and I’ve had several: about one every eight to fifteen months). I just checked my e-mail, Groupons, and FB on my iPhone, which I consult obsessively every ten minutes; and I lust after an iPad so that I can get my magazines digitally and read my blog subscriptions without squinting. 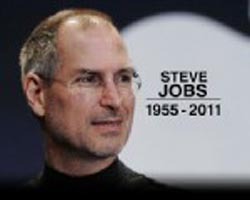 Feel free to be a Mac or a PC (which is almost as silly as being Team Jacob or Team Edward), but both Bill Gates and Steve Jobs have fundamentally changed the world we live in: the ways we communicate, acquire knowledge, and are entertained. How many people can say that? Thanks, Mr. Jobs. You’ll be missed. This entry was posted in Uncategorized and tagged Bill Gates, death, iPad, iPhone, Mac vs PC, MacBook Pro, Steve Jobs, Team Edward, Team Jacob, Windows. Bookmark the permalink.